For me a dessert is not something that guests need, it’s a part of the meal that is a real indulgence and a rare treat. For those reasons a dessert must deliver a true sense of decadence. I have yet to be convinced by the likes of trendy vegetable-based puddings popping up on new restaurant menus. When it comes to luxury and indulgence, carrots and dill just don’t do the trick! There is a lot to be said for an extravagant, yet elegant dessert. Over the years, we’ve had a number of complex desserts on the menu at Trinity – soufflés, parfaits and so on. Intricate puddings can, and often do, leave guests with a strong finish at the end of their meals. However the beautiful thing about desserts is that their success can be found within the simplest of approaches when expertly executed. So when cooking for my family at home, I often find that a brilliant chocolate brownie can provide the perfect post-dinner treat. For me, brownies must be soft in the centre, buttery and so chocolately that the sides of my mouth cringe with the richness. I also like mine with macadamia nuts. There’s a stall in Borough Market called Bread Ahead Bakery that sells fantastic brownies. I love them with vanilla ice cream and a single shot of espresso poured on top. Realising the balance between simplicity and sophistication is an ever-evolving process on our pudding menu. 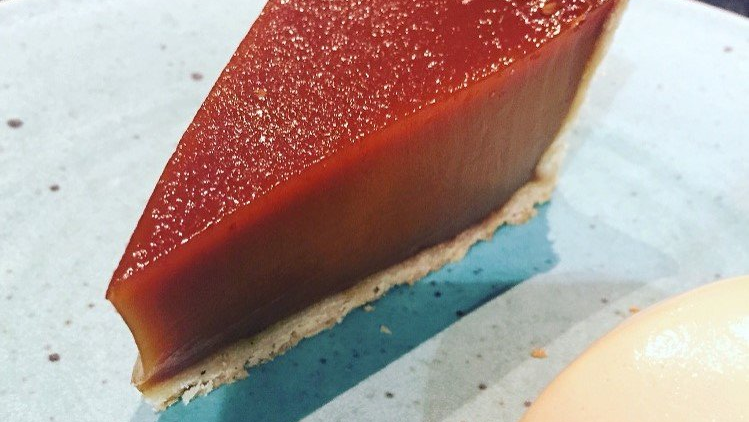 At Trinity, our ‘Salt Caramel Custard Tart’ has proven to hit a chord with our guests. For many of us with fond memories of traditional custard tarts, this is a very approachable dish in concept. I absolutely love a good twist on a classic pudding and for me, this ‘Salt Caramel Custard Tart’ just hits the spot. Finally for further ideas on desserts, I recommend ‘The Square Cookbook’ by Philip Howard for the enthusiast. Or try ‘The Complete Nose to Tail’ by Fergus Henderson for those after truly classic British puddings.